Ezra Price was born on 16 November 1824 at West Lavington, Wiltshire, and baptised at Market Lavington, Wiltshire, on 9 January 1825. He was the son of carrier James Price (1794-1860) and Susannah née Beckett (1794-1883). Ezra had seven siblings; Andrew (1817-1848), Zebedee (1818-1897), Elizabeth (b1820), Enos (1827-1913), Henry (b1829), James (b1833) and John (b1836). Nothing is known of Ezra's early life but on 6 February 1847, at the Independent Church, Market Lavington, he married Lucy Dennis (1825-1899), originally from Westbury, Wiltshire. They were to have four sons and three daughters; Andrew Ezra (1848-1888), Edward James (1849-1857), George Henry (1851-1920), Walter John (1852-1932), Elizabeth Lucy (1858-1948), Annie Jane (1860-1938) and Emma Dennis (1866-1963). 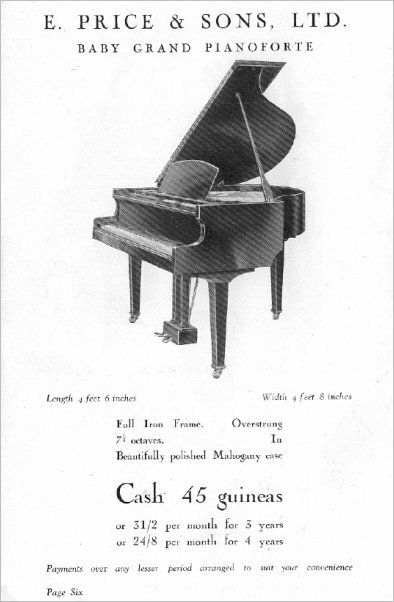 It was also in 1847 that Ezra started his own business, selling, hiring, tuning and repairing pianos. In the 1851 census Ezra and Lucy were living in Townsend, Market Lavington with their two eldest sons and a house servant. 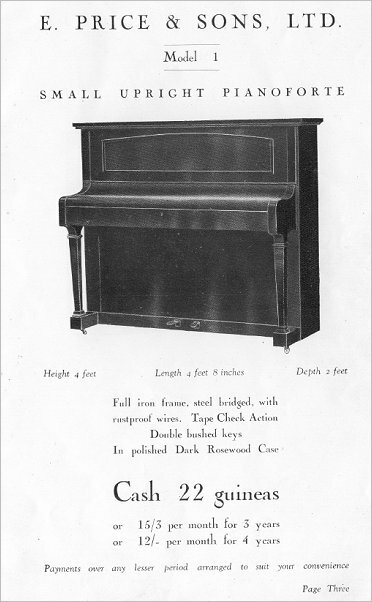 Ezra gave his occupation as a 'Piano Forte Tuner &c' while Lucy gave hers as a dressmaker. 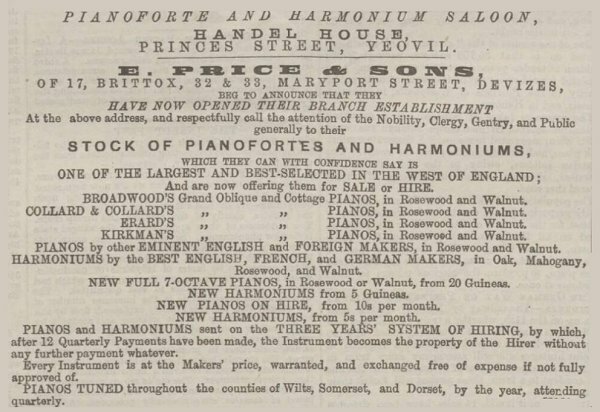 By 1853 the family had moved to The Brittox, Devizes, Wiltshire, where their remaining children were born and in the 1861 census Ezra gave his occupation as a 'Piano Forte Tuner & Repairer' while Lucy worked as a music seller'. They employed a house servant and a nursemaid. It is most likely that Ezra had a music shop as well as a workshop at the premises at this time. By 1860 Ezra had premises at both 17 Brittox (where they lived above the shop premises) and at 32 & 33 Maryport Street (where they would soon move to). By the time of the 1871 census they had moved to an impressive property on the corner of The Brittox and Maryport Street (see Gallery) where Ezra began selling pianos rather than just tuning and repairing them, giving his occupation in the census as a 'Piano Seller'. George, Walter and Elizabeth were still living at home, as were a general servant and a nurse. In the meantime Ezra's son, Andrew, had married Emma Elizabeth Allwood in the summer of 1870. Andrew and Emma were to have three daughters; Winifred Lucy (1872-1937), Nellie (1873-1874) and Dora Adelaide (1875-1908). 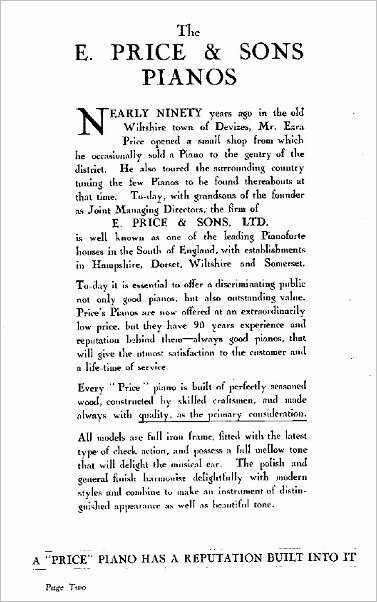 They moved to Yeovil and Andrew opened a branch of E Price & Sons at 19 Princes Street in October 1870. 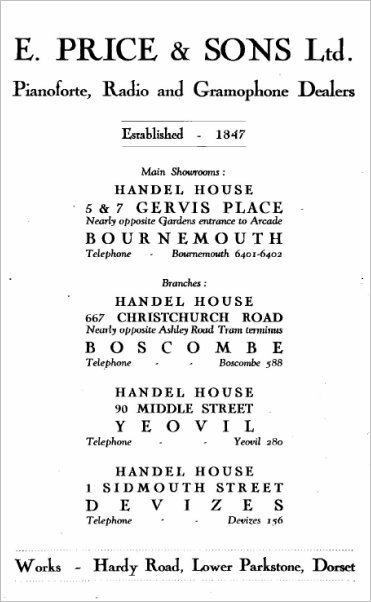 It was named 'Handel House' and Andrew placed an advertisement in the 28 October 1870 edition of the Western Gazette announcing the new business. In the 1871 census Andrew was listed with his wife's parents in Northgate Street, Devizes. He gave his occupation as a pianoforte maker. Emma, together with Andrew's mother Lucy and sisters Annie and Emma were listed at the Princes Street address. 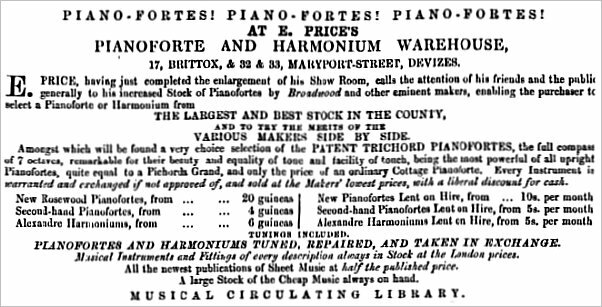 Price & Sons were advertised in the Post Office Directory of 1875 as owners of the 'Pianoforte & Music Warehouse' in Princes Street. 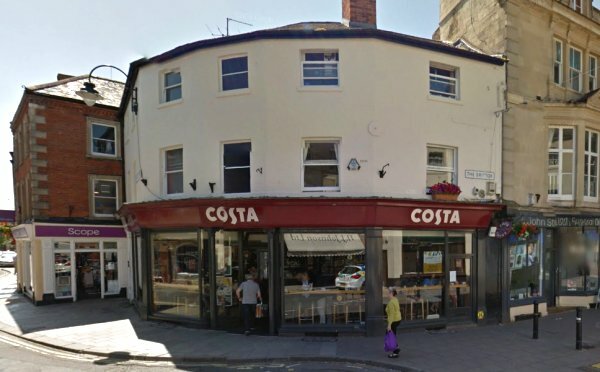 By 1881 Ezra had moved his premises yet again, this time to Sidmouth Street, Devizes (Sidmouth Street lay opposite his previous Maryport Street premises). 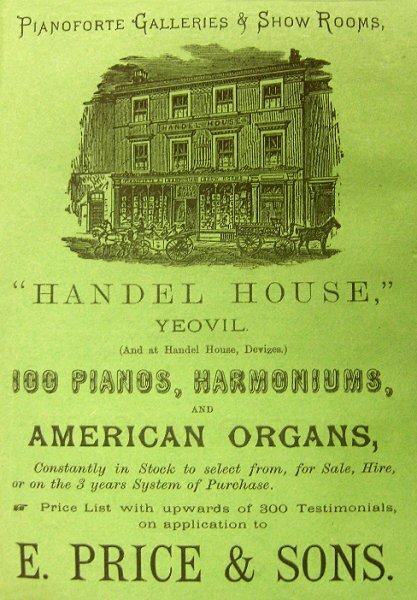 His new premises he called 'Handel House' - a name he would use on all his future branches, including Yeovil. The Price family lived on the premises which they shared with the family of outfitter and draper Jos. Sloper. 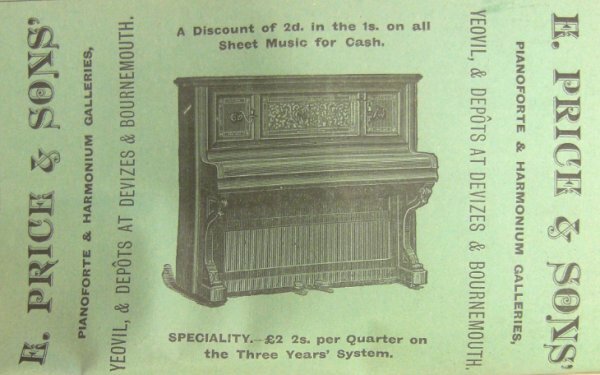 In Yeovil the 1881 census listed Andrew, daughter Winifred and a servant at Princes Street where he gave his occupation as 'Pianoforte Dealer & Tuner'. Emma was visiting her parents at Reading, Berkshire. 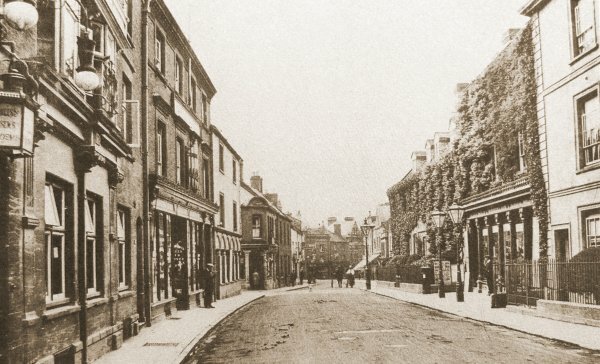 In the winter of 1881 at Devizes, Ezra's daughter Elizabeth married Herbert Samuel Ford. In the spring of 1888 Andrew Price died in Yeovil. He was aged 39. In the following census of 1891 his widow Emma was living with her cousin in Reading but by this time Ezra had moved to Yeovil. He was living above the Princes Street premises with his daughter Elizabeth and her husband Herbert Ford and their four children, together with three domestic servants. 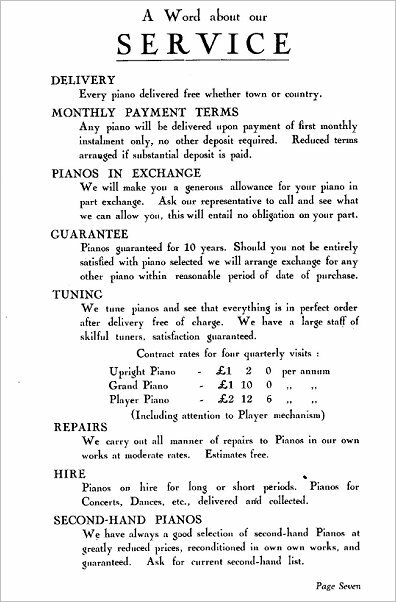 Ezra gave his occupation as a piano dealer while Herbert gave his as 'Manager for Musical Instrument Dealer'. Once the management of the Yeovil branch of the business was established, Ezra moved back to Devizes where he died at Handel House on 23 February 1904. He was 79 years old. His will was proved in April and his effects valued at £19,362 (in excess of £7 million at today's value). Following his death the company was run by his grandsons. 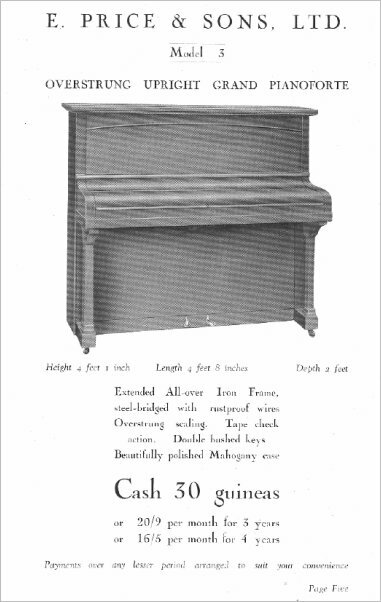 During the 1930s the Princes Street premises were closed and Price & Sons moved to 90 Middle Street where their 'Pianoforte Warehouse' was listed in Kelly's Directory of 1935. The company expanded, finally having branches in Yeovil, Devizes, Boscombe, Winton, Southbourne, Bournemouth and Amesbury by the mid-1940s. 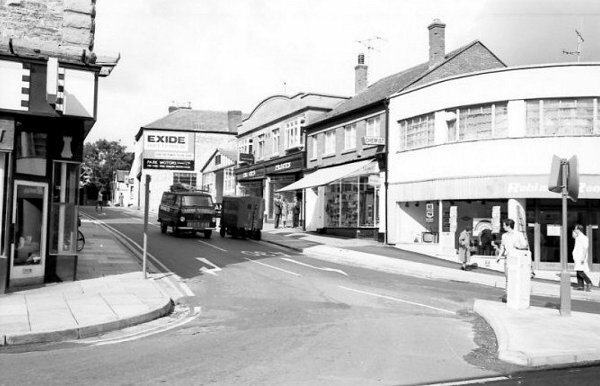 By the 1950s Price & Sons had moved again, this time to 4-6 Park Road, where they remained until the late 1960s or early 1970s. One of Ezra's earliest advertisements from the 20 December 1855 edition of the Devizes and Wiltshire Gazette. 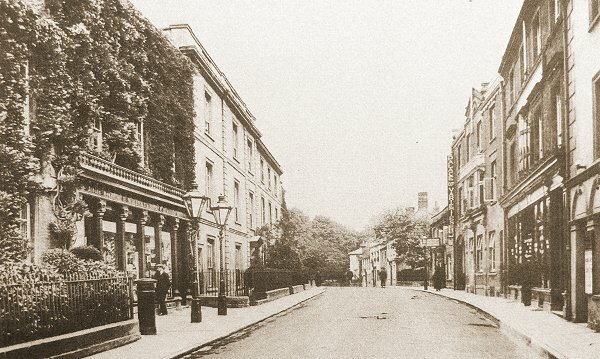 Ezra and Lucy's home, and his piano showroom, in Maryport Street on the corner with The Brittox, Devizes, Wiltshire. 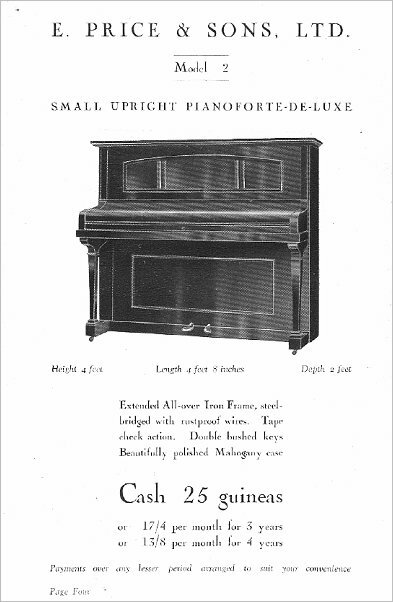 It was from here that Ezra began selling pianos rather than just tuning and repairing them. Ezra's advertisement in the 19 January 1860 edition of the Devizes and Wiltshire Gazette. Andrew's advertisement in the 28 October 1870 edition of the Western Gazette announcing the new business. The advertisement for E Price & Sons in the 1878 edition of Whitby's Yeovil Almanack Advertiser with a sketch of the Princes Street 'Handel House' complete with a set of organ pipes fixed to the wall above the entrance door. The 1891 advertisement for E Price & Sons in Whitby's Yeovil Almanack Advertiser by which time the company had expanded to Bournemouth. This postcard is dated 1905. It features Ebenezer Whitby & Sons' bookshop, printers and stationers at (now 31) Princes Street with a pair of single Sugg lamps outside and at extreme left with the organ pipes fixed to the wall above the entrance, is E Price & Sons' 'Handel House'. A photograph of the southern end of Princes Street, looking towards High Street, and dating to around 1900. Again, at left with the organ pipes fixed to the wall above the entrance, is E Price & Sons' 'Handel House'. A photograph of the northern end of Princes Street dating to around 1900. At right, with the organ pipes at first floor is the shop of Price & Sons. Looking from Princes Street along the northern side of Park Road in the 1960s. The building at centre with the rounded parapet is E Price & Son's music shop that sold pianos and other musical instruments as well as records, radios, etc. 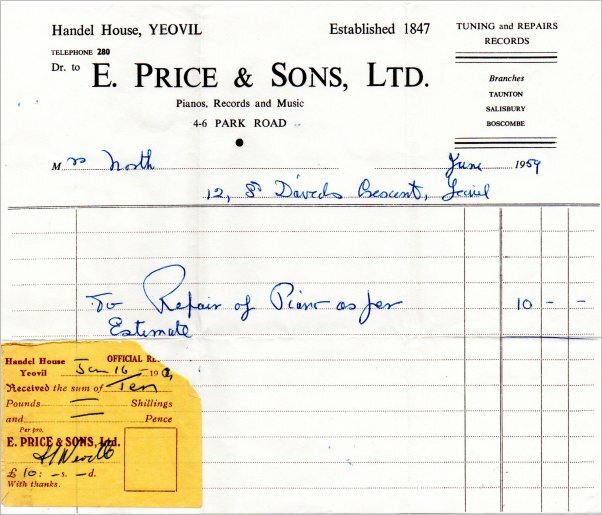 An invoice for piano repairs dating to June 1959 when E Price & Sons were at 4-6 Park Road. 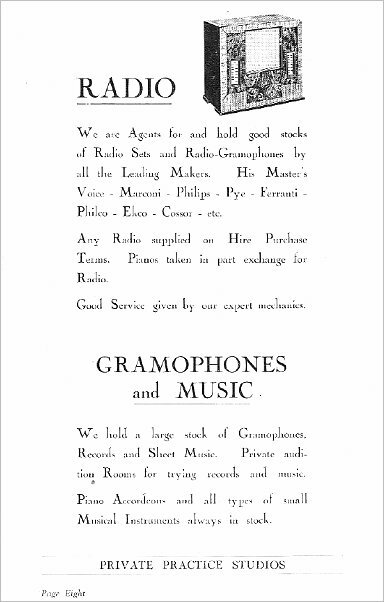 The following is a complete Price & Sons' 8-page catalogue dating to the late 1930s at which time Price & sons had moved premises to 90 Middle Street.